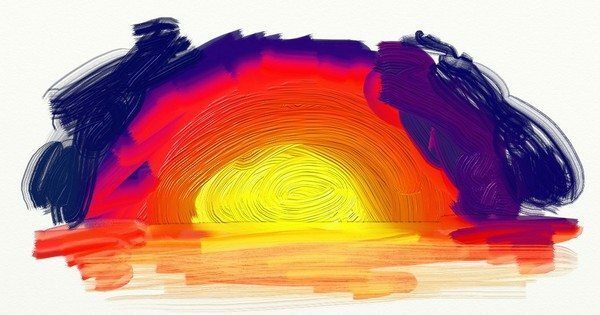 The oil paint is probably the tool that ArtRage is best known for, and it’s the first tool most users try when they open the program. It’s definitely one of the most fun painting tools in the program, and according to almost every review we’ve read, we have the most realistic oil paints in any of the digital art program on the market. The default ArtRage canvas is well suited to just jumping in with the oils, but it’s often worth experimenting with different canvases. 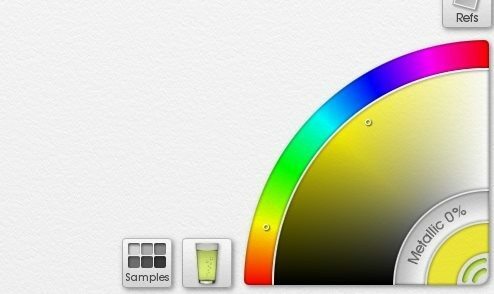 Turn on Real Color Blending (Tools > Color Options in ArtRage 4) for the best color mixing effects. The oils are generally not a very delicate tool. If you’re trying to actually draw, use a different tool. If you find the oils are a bit too heavy and uncontrollable for you, try reducing the loading and pressure and increasing the thinners. The Palette Knife and the Paint Tube both offer different ways to apply oil paint, so it’s worth experimenting with them at the same time. 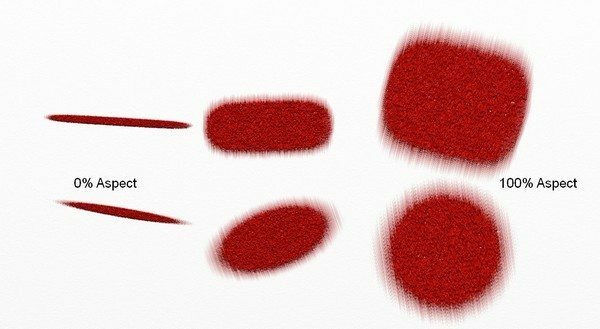 Pressure lets you roughly control the size and how much the brush varies based on the pressure you apply with a stylus. Imagine you’re lightly brushing, or forcefully pushing, your brush down on the canvas. Bristles are going to splay out and it will affect everything you try and do. Brushes are flexible, so you’re going to get variation with every stroke. You can get small strokes with high pressure, but it’s really tricky. Loading is how much paint is loaded onto your brush, and therefore, how long your brush strokes can be before running out of paint. Very low loading is awesome for dry brush effects. The amount of loading you need for a certain length stroke will depend on the size of your brush and the amount of canvas space you’re using (the length will be the same, but it will look very different if you’re drawing on a 500 pixel canvas compared to a 5000 pixel canvas). Thinners control how much solvent (’oil compatible water’) you are using in your paint. Boosting the thinners up to around 50% will mostly ‘flatten’ the paint, so you can get rid of the dramatic texturing from the brush bristles (because diluted paint doesn’t hold texture). Your brush will still pick up any thick paint as it passes by. Thinners can be good for blending existing paint more smoothly. Insta-Dry automatically dries the paint. Turning Insta-Dry off will let you mix up paint again – it only applies to the current stroke, rather than changing the entire painting. Auto Clean will toggle whether your brush automatically cleans itself when you lift it or whether it stays dirty and keeps using the mixed colour. Aspect is the ‘shape’ of the brush strokes. 0% Aspect has one very thin edge and one very large flat side. 100% Aspect is completely round. Square Head toggles the brush between square and round. Rotation is the default angle that your brush starts at. You won’t see visible Rotation at 100% Aspect (round brush), so make sure to set Aspect to a lower value. 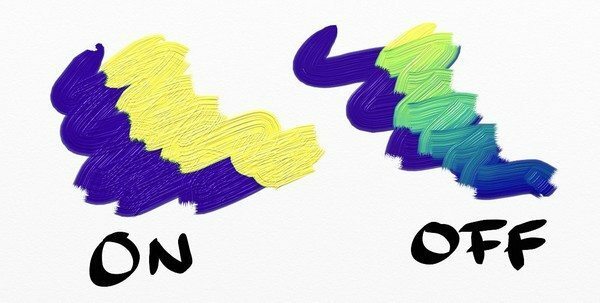 Oil brush rotation changes as you paint; the rotation value is just the default starting point. There’s not really a lot of difference between flipping the brush 180 degrees and the full 360 degrees… unless you have a dirty brush (with auto clean off), or are using very specific settings. This can be controlled by barrel rotation of the stylus, if you’e got a fancy stylus, but the two effects can stack in interesting ways. 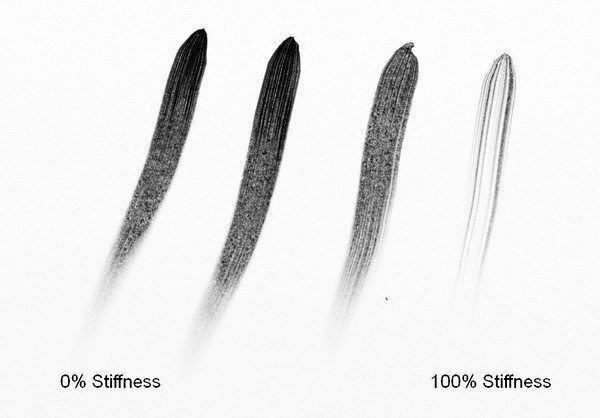 Stiffness affects the texture of the bristles and how soft or stiff they are.